Our beautiful artificial trees provide you the same appearance and classic aesthetic of a Christmas tree without the tiresome mess and maintenance that a conventional tree requires. Designed with a perfect cone shape, the tree narrows on its way up to a nice point on the top on which you can attach the centerpiece ornament. With eight different light functions you can change up the color combination from blinking to waves to many other types at any time you want. 7 FOOT TALL CHRISTMAS TREE: Stands seven feet tall and serves as the focal point of any room that it's placed in during the holiday season. 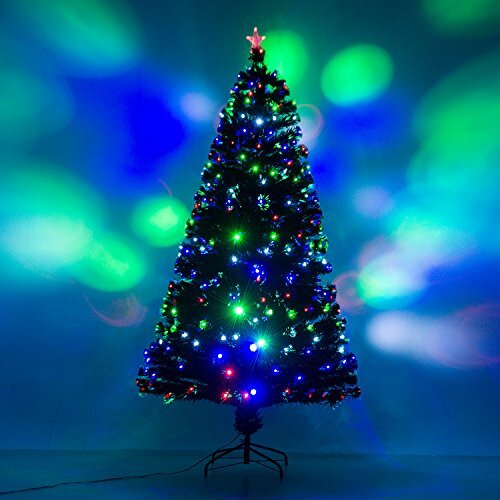 PRE-LIT FIBER OPTICS AND LED LIGHTS: Includes 280 pre-installed multi-colored LED lights and fiber optics bring a festive, welcoming atmosphere to your home. 8 FLASHING LIGHT FUNCTIONS: Features a large variety of flashing functions including Waves, Slow Glow, Slow Fade, Twinkle/Flash, Combination, Sequential, Chasing/Flash, and Steady On. 280 FULL INDIVIDUAL BRANCH TIPS: Full-body shape is provided by plentiful branch tips for a life-like look that offers plenty of space for ornaments. STURDY METAL BASE INCLUDED: Durable metal base is included to provide stability while keeping your tree upright and secure.